When playing the game for the first time, you will be confronted with some of the basic rules which are explained below. For starters, each player is dealt two hole cards in Texas hold'em with the overall goal of making the best five-card hand. Play moves clockwise around the table, starting with action to the left of the dealer button. 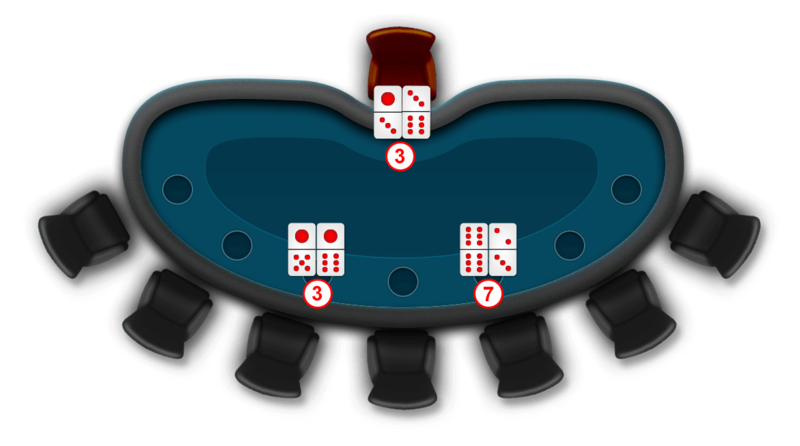 Generally, the first two players to the immediate left of the button are required to post a small blind and a large blind to initiate the betting. From there, action occurs on multiple streets: Preflop, Flop, the Turn and the River. The button determines which player at the table is the acting dealer. In Texas hold'em, the player on button, or last active player closest to the button, receives last action on all post-flop streets of play. Before every new round, two players at the table are obligated to post blinds, or forced bets that begin the wagering. Without these blinds, the game would be very boring because no one would be required to put any money into the pot. In Texas hold'em, every player receives two cards face down, called Hole cards. Every player keeps these cards to conceal until the end of all of the betting rounds, which is called the showdown. Texas hold'em is a game of community cards, where five cards are displayed in the middle of the table to be used in conjunction with a player's two hole cards in order to make the best five-card holding. 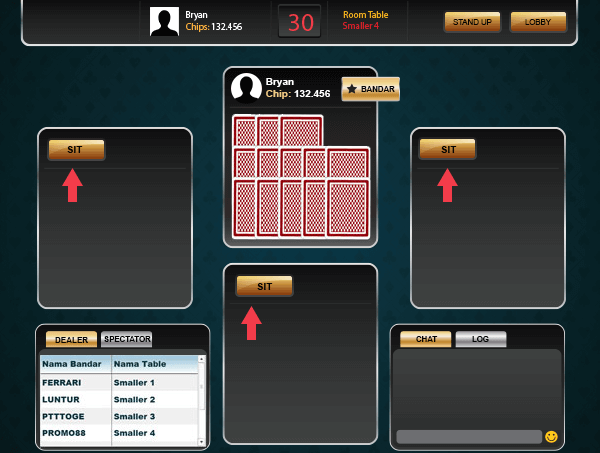 The five community cards are displayed in the middle of the table on the flop, the turn and the river. The flop consists of the first three community cards, the turn adds another and the river completes the board with one more. These five cards are visible for every player. Once all five cards are down, players have to make the best five-card combination from these seven cards. This can be done using both of your hole cards in combination with three community cards, one hole card in combination with four community cards or no hole cards and playing all five community cards as one's hand. The player with the best combination of cards wins the pot, which is the sum of all bets that have been placed during that hand. The players who follow have the same three options: Call, Raise or Fold. In the case of raising, the minimum allotted amount for a raise must be equal to the original raise amount. For example, let's say the big blind in a game is $10 and the first player to act raises to $40 in a game of no-limit hold'em. The second player to act has the option to call for $40, fold and no longer play the hand, or raise to $70 as the first raise amount of $30, the difference between the wager placed and the original big blind. Three community cards are dealt on the table and a new betting round begins. The fourth community card is called the 'Turn' and again a new round of betting starts. The fourth community card, called the turn, is dealt face-up following all betting action on the flop. Once this has been completed, another round of betting occurs, similar to that on the previous street of play. Again players have the options to bet, call, fold, raise and check. The fifth community card, called the river, is dealt face-up following all betting action on the turn. Once this has been completed, another round of betting occurs, similar to that on the previous street of play. Again players have the options to bet, call, fold, raise and check. After all betting action has been completed, the remaining players in the hand with hole cards now expose their holdings to determine a winner. This is called the showdown. The remaining players open their hole cards, and with the assistance of the dealer, a winning hand is determined. The player with the best combination cards winning the game. 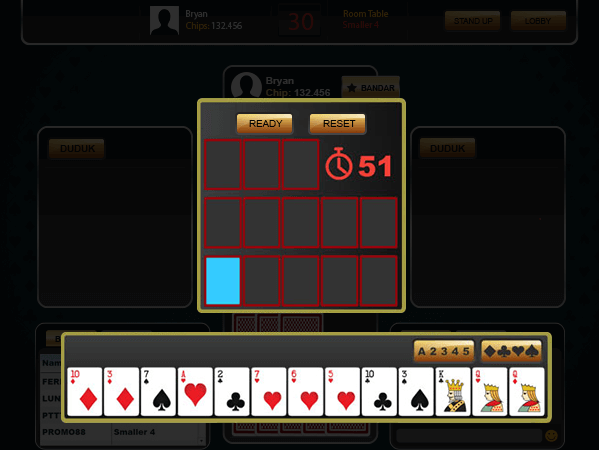 Royal Flush: Royal flush is the best poker hand combination. Consists of the Ace, King, Queen, Jack and Ten of the same suite. In the event of a tie: The highest rank at the top of the sequence wins. In the event of a tie: The highest rank of four-of-a-kind wins. In community card games where players have the same four-of-a-kind, the highest fifth card ('kicker') wins. In the event of a tie: The highest three matching cards wins the pot. In community card games where players have the same three matching cards, the highest value of the two matching cards wins. In the event of a tie: The player holding the highest ranked card wins. If necessary, the second-highest, third-highest, fourth-highest, and fifth-highest cards can be used to break the tie. If all five cards are the same ranks, the pot is split. In poker, the suit is not used to break a tie. In the event of a tie: The highest ranking card at the top of the sequence wins. In the event of a tie: The highest ranking three of a kind wins. In community card games where players have the same three of a kind, the highest side card, and if necessary, the second-highest side card wins. In the event of a tie: The highest pair wins. If more than one player have the same highest pair, then player with second-highest pair wins. If both players have two identical pairs, then the highest side card wins. In the event of a tie: The highest pair wins. If players have the same pair, then the player with the highest side card wins, and if it’s necessary, the second-highest and third-highest side card can be used to break the tie. In the event of a tie: The highest card wins, and if necessary, the second-highest, third-highest, fourth-highest and smallest card can be used to break the tie. This tutorial will teach you the basic of 99 domino, counting the cards, rules and all you need to become 99 domino player. Count the total dots of all cards to determine the value. In Domino QQ game each player get 4 of domino cards divided by 2 sections and call the two cards on the left are 'Left Side” and two cards on the right are “Right Side”. In this game your card values are on the Left Side and on the Right Side. See example below for details, the numbers in circle represent the value of two card on the left and the right side. You don’t have to count each dots of the card while playing in the game, the left side value and the right side value will display automatically on the game. The left side value will be bigger than the right side value, or both sides with the same value In 99 Domino 4 cards game has 5 special mixed card beside normal card value. These special cards displayed are the best card in domino game, these special cards also apply for jackpot winning, players who have one of these special cards will get the jackpot depends on the buying jackpot and the prize, see the rules and jackpot prize from the jackpot menu. The highest in special cards. If you have these cards, you definitely win the game because no other players will get these cards. The second place in special cards. If you have four of these cards, no other player could get another twin cards. So, you will win the round, except if another player had 6666 cards. player had 6666 or Twin Series. Like the given example below, the total dots are 41, so this series consider as Pure Big Card. The fourth place in special cards, If you have total dots between 6 to 9 then you card is a Pure Small Card, no other player can ever get small cards like this and you will win the game, except if other player had 6666, Twin Series or Pure Big. The last special card is Double 9 or QQ which is the total value of two cards on the left and the right side is 9, so you get 99 cards, the highest value in normal cards. Other players may have the same 9 cards, if do so the winning pot will be split. Now you can start playing! Good luck and have fun!! This tutorial will explain the gameplay of Domino Dealer or in south east asia is called CEME, because you can be a player or a dealer. This game almost the same as Domino QQ . The different is Domino QQ use 4 Domino's card, but in Ceme the gameplay just use 2 Domino's card. Ceme game is played by 2 to 8 players (black chair) and one player will take the role as the dealer (Red Chair). If no one takes the dealer role, then the game will not start until someone does. Once the player is given two cards, then the player is given a chance to peep cards they get. After the peeps time over, players must show the cards at the table. 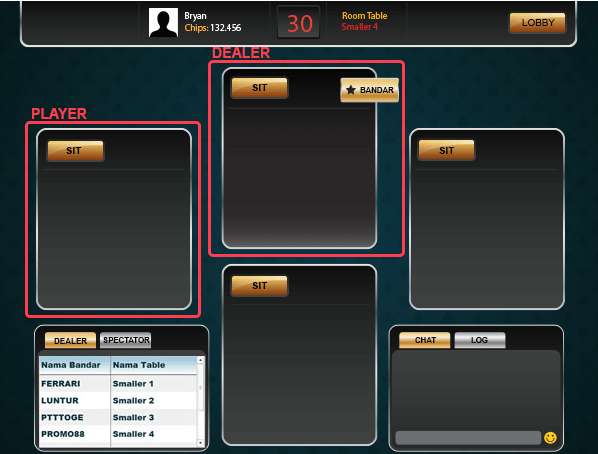 After all the player and dealer card shown on the table, the calculation will be done between the dealer's card and the player’s card. higher values card will win the game. To know the counting in this game is just count the total dots on each card on the left and sum it with the total dots on the right side. If the value of player’s card is greater than the dealer’s, then the dealer will pay the amount of player’s bets. When the value of dealer’s card is greater than the player’s, then the dealer will take the player’s bet money. Dealer will always win if the dealer gets the same value as the player. If the player/ players get cards with the value of 9, the dealer has to pay double amount of the player/ player’s bet. If the dealer gets cards with the value of 9, dealer takes all player bets even if the player has the highest number. Special cards in ceme only applies for the Jackpot. Since the special card has to be 4 cards in order to win the jackpot, the winning cards will be; the dealer’s cards combined with the player’s cards. If you are the dealer and you want to get the jackpot, you have to buy the jackpot for each player on the table(including yourself). Giving you more chances to win more than one Jackpot. If you are a player you just need to buy the Jackpot for yourself. Note : if the merging cards between player and dealer match one of these special cards below, than the jackpot will be given to the player or dealer who bought the jackpot on that round. Only 4 out of all 28 domino cards has the amount of six dots in it. Player and dealer have to have this combination of cards. Upper and lower side has the same amount of dot(s) including empty dot. Player and dealer have to have this combination of cards. Pure Big Card, no other player will have same big cards. Player and dealer have to have this combination of cards. Fourth place in special cards, If you have total dots between 5 to 9 then you card is a Pure Small Card, no other player will have same small cards like this. Player and dealer have to have this combination of cards. 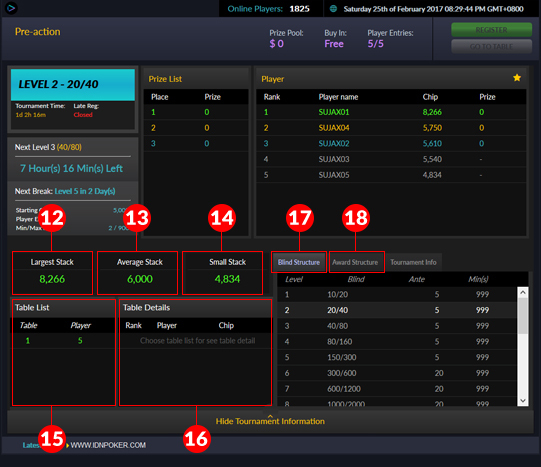 If you want to sit as a Dealer, then click the top seat as in the figure. If you already click and sit, just stay there waiting for player / other players to join in your table, and the game will be started. Click the 'Ready' button when you have finished arranging your cards, or click 'Reset' button to cancel the arrangement and rearrange. If you want to exit or finish a game, click the 'Stand Up' button to stand up from a chair. 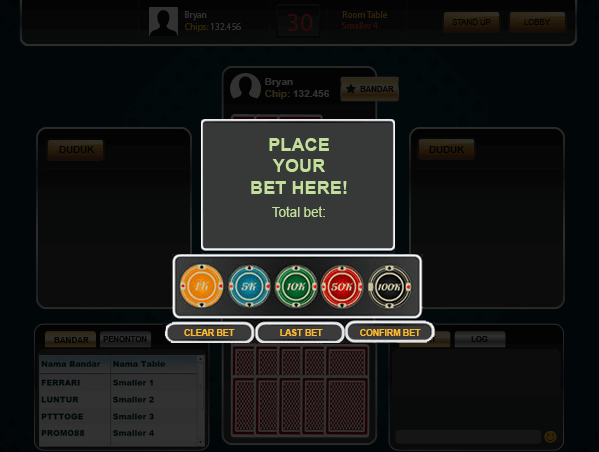 If you want to play as a player (not a dealer), select and click an empty / available chair and please wait until the game starts to place your bet. Your minimum bet must comply with the minimum bet on table that you entered. If you have placed your bet, then the game will start immediately and the card will be distributed. Click 'Ready' button when you have finished composing the card, or click the 'Reset' button to cancel the arrangement and rearrange your cards. Click to see our cards in accordance with same symbol/suit. Dragon Cards is the highest Hand in the CAPSA game. 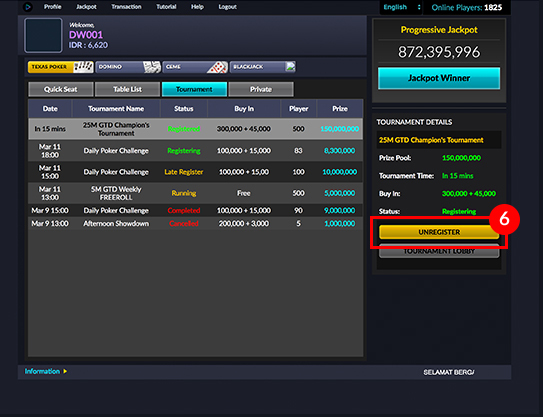 If the player or the dealer has dragon cards (Capsa), the payment will be 2.5 times the total bet. Royal Flush is the 2nd highest combination. If players get a Royal Flush, payment will be 2 times the total bet. If two players have the same ranked Royal flush, the winner will be determined by the higher suit. Suit ranking (highest to lowest): Spade, Heart, Club, and Diamond. Straight Flush is the 3rd highest combination. If players get a Straight Flush, payment will be 2 times the total bet. If two players have the same ranked straight flush, the winner will be determined by the higher suit. Suit ranking (highest to lowest): Spade, Heart, Club, and Diamond. Four of a Kind is the 4th highest combination. If the player has a Four of Kind, payment will be 1.5 times the total bet. Full House is the 5th highest combination. Full Houses will be ranked by comparing the Three of a kind of each hand to determine the winner. Player will win because player has Full House Ace. Flush is the 6th highest combination. If two players have a Flush, the player with the higher ranked suit will win, but if the suit is the same, then the rank of the cards will be compared. Player will win because dealer has a Heart Flush while the Player has a Spade Flush. Straight is the 7th highest combination. If player and dealer have Straights on the same level, then, Straight will be ranked by comparing the highest card of each Hand. Dealer will win because Dealer has a straight To 9 while Player has a straight to 5. If player and dealer have a same highest card then, the winner will be determine by the higher suit of the highest hand. Dealer will win because Dealer’s suit is Club, which is the higher rank than Diamond. Three of a kind is the 8th highest combination. Dealer will win the match because dealer Three of a Kind 7s. Two Pair is the 9th highest combination. 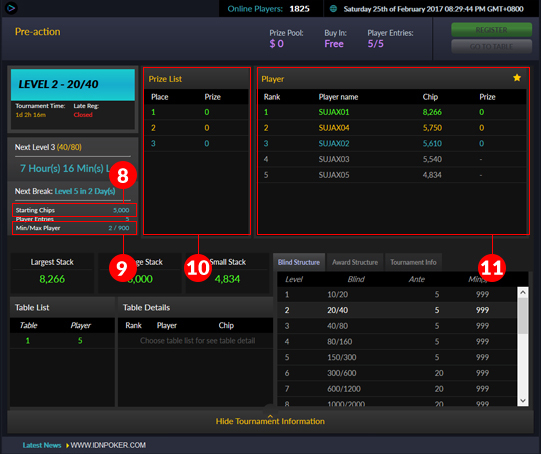 If both player and dealer have two pairs, determining the winner is by comparing the higher rank. Dealer will win the match because dealer has the higher pair with Ks. If player or dealer have a same Two Pairs the winner will be determine by the suites of the higher Kicker. Player will win because of higher Kicker, which is Ace. Pair Card is the 10th highest combination. 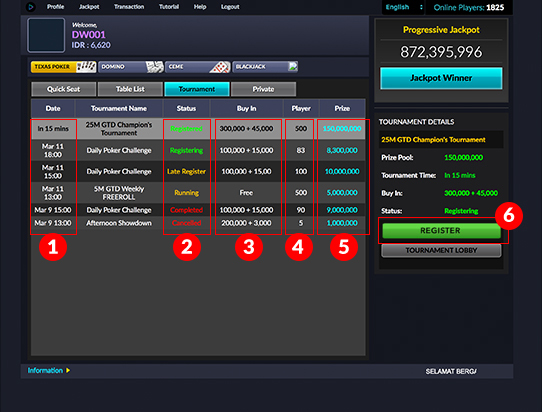 If both player and dealer have a pair, determining the winner is by comparing the higher rank. Player will win because player has a pair of Ace. If both player and dealer have the High Card Hand, the rank of the highest cards will determine the winner. In case of a tie, the rank of the next highest card will determine the winner. Player will win the match because player has high card Ace continued with 10 and 6. If both player's and dealer's High Cards have the same rank the winner will be determined by the suite of the highest ranked card. The dealer will win because Dealer's card is Heart, which is the higher rank compared to the Club. Super10 is a simple game inspired by Samgong game or Three Pictures. The difference is that we play Super10 among players while Samgong is played with a dealer. At the beginning of the game, every players will get 2 (two) cards and 1 (one) additional card will be given so each player will have 3 (three) cards in a total. Before the game starts, all players must place a bet (Ante) to build the pot prize to make the game more interesting. The objective of this game is to get a high value from hand cards. The highest value is 10. The value of the cards are shown below. 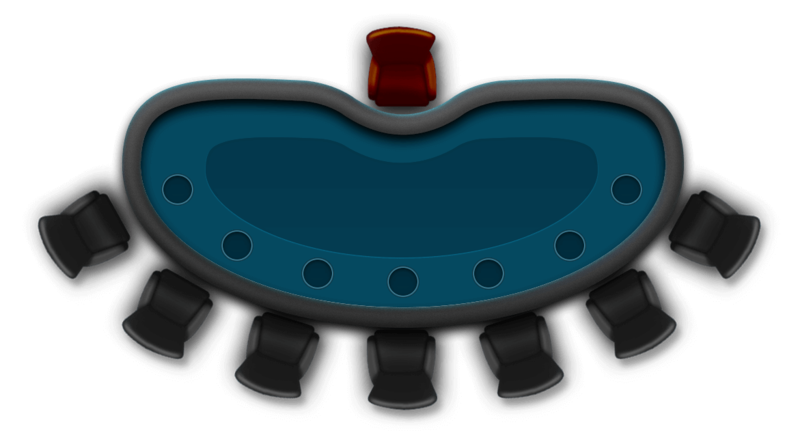 The game will move clockwise, starting from the left side of the dealer button (previous winner). Before the game starts, all players must put their Ante (Ante is the required bet from all players before the game starts) according to the value that has been decided on the table list. In this game, every player will receive 2 cards in the beginning and will receive another 1 card after that. Every player will have 3 cards in their hand and the player who has the highest card value wins the game. Combination of 3 cards with the total values of 20 or 30. Q, J and K card is counted as 10. If the total value of the cards has 2 digits (ex. 17), then the last number (ex. 7) will be set as the value. Each J, Q and K card will be counted as 10. If there are 2 players or more having the same highest value, the winner will be decided according to the highest hand (K - A). If players also have the same hand cards, the winner will be decided according to the highest suit (1. Spades 2.Hearts 3. Clubs 4.Diamonds). Pot Limit Omaha is an action-packed game derived from Texas Hold’em Poker. Players are given 4 cards (hole cards) after which betting rounds and 5 community cards will happen. Players must now have the best 5 card poker hand using exactly 2 cards from their hand and exactly 3 cards from the community cards. The button determines which player at the table is the acting dealer. In Pot Limit Omaha the player on button, or last active player closest to the button, receives last action on all post-flop streets of play. Before every new round, two players at the table are obligated to post blinds or forced bets that begin the wagering. Without these blinds, the game would be very boring because no one would be required to put any money into the pot. Pot Limit Omaha will have Antes, this is a small amount which all the players seated on the table will put into the Pot before the hands starts. Antes are posted before the Blinds. Minimum raise:The raise amount must be at least as much as the previous bet/raise in the same round. Example:Player1 bet 2000, and the total pot is 3000. Now, Player2 can raise to a maximum of 9000 (3000 + 2000 + (2 x 2000)). Four Hole Cards (private cards) are dealt to each Player. The 1st Betting Round starts from the player next the Dealer button going clock-wise. The “Flop” comes out, these are three community cards dealt in the middle of the table. 2nd Betting round starts. Starting from the active player after the Dealer button. The “Turn” is dealt after the Flop. The “River” is dealt after the Turn card. 4th and Final Betting round starts. Check:Take no action and let the next player take his turn. This action can only be taken if there is NO bet/raise to call. Call:match the amount bet/raised by another player. Bet/Raise:increase the bet within the specific limits of the game. Fold:Discard your hole cards and surrender any claim to the Pot. After the last Betting Round All players still in contest for the pot will compare Hands, the cards of the player with the best hand will be displayed. The winner will be the player with the Best 5-card Poker Hand, using exactly 2 cards from the players hole cards and exactly 3 cards from the Community cards. 5-Card Poker Hands: Starting from Highest Valued hand to the Lowest Hand Combination. 1. 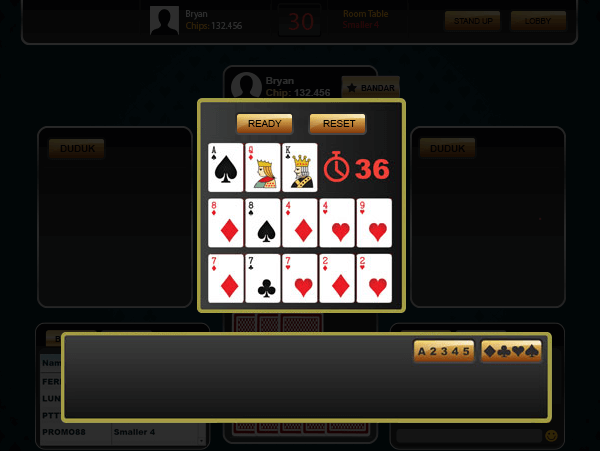 Royal Flush: Royal flush is the best poker hand combination. 2. Straight Flush: Five cards in numerical order, all of identical suits. In the event of a tie: Highest rank at the top of the sequence wins. The best possible straight flush is known as a royal flush, which consists of the ace, king, queen, jack and ten of a suit. A royal flush is an unbeatable hand. 3. Four of a Kind: Four cards of the same rank, and one side card or ‘kicker’. In the event of a tie: Highest four of a kind will win. 4. Full House: Three cards of the same rank, and two cards of a different, matching rank. 5. Flush: Five cards of the same suit. In the event of a tie: The player holding the highest ranked card wins. If necessary, the second-highest, third-highest, fourth-highest, and fifth-highest cards can be used to break the tie. The suit itself is never used to break a tie in poker. 6. Straight: Five cards in sequence. In the event of a tie: Highest ranking card at the top of the sequence wins. Note: The Ace may be used at the highest or lowest of the ranks and is the only card which can act in this manner. A,K,Q,J,T is the highest (Ace high) straight; 5,4,3,2,A is the lowest (Five high) straight. 7. Three of a kind: Three cards of the same rank, and two unrelated side cards. In the event of a tie: Highest ranking three of a kind will win. In community card games where players have the same three of a kind, the highest side card, and if necessary, the second-highest side card wins. 8. Two pair: Two cards of a matching rank, another two cards of a different matching rank, and one side card. 9. One pair: Two cards of a matching rank, and three unrelated side cards. 10. High card: A hand that does not qualify under any category listed above. 1. Click on the Tournament Tab to go to the Tournament Section. 2. Select the Tournament you want to join. 3. Click the Register button on the right side of the page. 5. And click on the Go to Table button and Start playing! 6. Once registered you may unregister (refund) anytime before the tournament starts if needed. If you are registered but coming late to the tournament, you will have to pay the ante and the blinds every time your turn comes. Players may still register and unregister for this Tournament. Players may only register & play in one tournament at a time. The Tournament has started but still allow players to register. The Tournament is ongoing and will not accept any more entries. The tournament didn't start at all. It was canceled due to some requirements are not met. 3. Buy In: The amount to join the tournament (Prize contribution + entry fee). 4. Players: Indicates the current number of players registered for the Tournament. 5. Prize: Indicates the current amount of prize in the Prize Pool. 6. Register: You join the Tournament and play by paying the Buy In. May only be done during Registration and Late Registration period. 7. 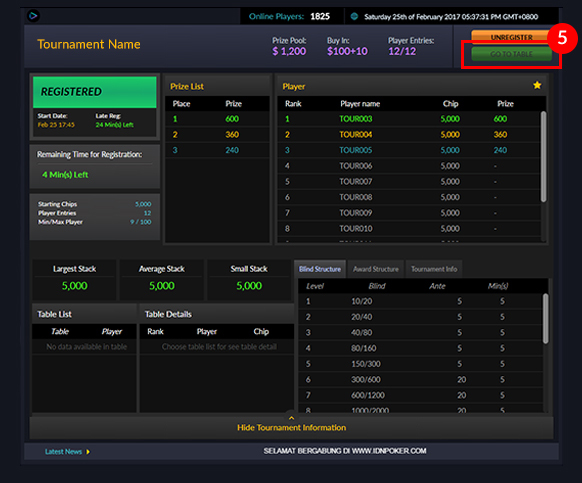 Unregister: To refund the Buy-in and get removed from the Tournament registrant. It can only be done before the tournament starting time. 8. Starting Chips: Indicates the chip amount given to each player to start the tournament. 9. Min/Max Players: Minimum and Maximum number of players that can register for the Tournament. If the minimum number of players is not reached the Tournament will be cancelled. The Prize is awarded into your account wallet automatically when you get eliminated from the Tournament. Real-time list of players, ranked according to current chip possession. Also, it shows the Prize payout for each rank. 12. Largest Stack: The chip count of the player with the most chips in the Tournament. 13. Average Stack: The average chip stack size considering the amount of players remaining in the Tournament and the total number of chips in play. 14. Small Stack: The chip count of the player with the lowest chip stack. More important is that the total of your chip is at least 25 times the current Big Blind! 15. Table List: Shows the tables in the tournament and how many players are in each table. 16. 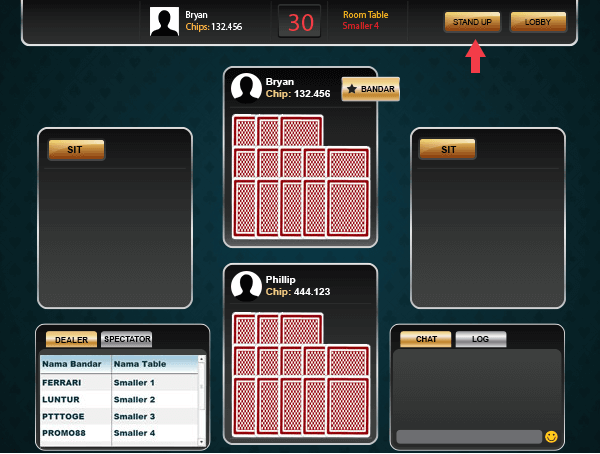 Table Details: Select a table from the Table List to see the usernames of the players on the table, their rank and chip stack count. 17. Blind Structure: Shows how much the Small Blind/Big Blind, Ante and duration of each Level for the whole tournament. 18. Award Structure: The list of the Percentage from the Total Prize pool and amount that will be awarded to the winning players according to the Rank/Place. 1. There are no re-buys, once you lose all your chips you are out of the tournament. So play your best! 2. The Buy-in is your payment for joining the Tournament; The more players join the bigger the Prize will be!! 3. You may register and unregister for a Tournament during the registration period, but when the Tournament starts, players cannot unregister anymore. 5. The tournament will end if the player is only one left. 6. If the tournament has started and you have not logged on, your chips will be blinded out until you log on and sit on your table. 7. You may not quit or leave the tournament as long as the you still have chips. If you did, then you will have to pay the blinds and antes, and your Hands will be automatically set to fold. 8. To win a cash prize, you must get eliminated in those ranks with a cash prize. It depends on the Prize Structure of the Tournament. The more registered players, the more ranks that have cash-prize will be. 9. The Blinds will increase every level. 10. There will be scheduled breaks during the Tournament. 11. If you fail to select an action until the timer runs out, by default, the action will be a check or a fold. Then, your account will be sat out. You may sit-In at any time so you may play the next upcoming Hand. 12. You may “sit in” by clicking the “Sit In” button located at the center of the player HUD. Tutorial : What are Tcoins(TC)? Answer : Tcoins is short for Tournament Coins, these coins are earned by players from playing at any of our games. Your Tcoins balance is displayed on the Main Lobby right below your wallet balance. These Tcoins can be used to join our Tcoins exclusive Tournament Freerolls. Players may only join this Tournament Freeroll using Tcoins. Tcoins have no monetary Value. Tcoin Freerolls can be found at our Tournament Lobby. Earning Tcoins is now capped at a maximum of 1.2Milllion Tcoins balance. If your current balance is over 1.2 Million you will not earn Tcoins until your balance is below the cap(1.2M Tcoins).